Emil Wolf, a longtime University of Rochester professor whose pioneering theories connected fundamental equations describing electromagnetism to the observable properties of light, has died at age 95. He is survived by his son Bruno and daughter Paula and his beloved wife Marlies. One of the most recognized optical scientists of his generation, Wolf, the Wilson Professor of Optical Physics at Rochester, was a leading expert in coherence and polarization of optical fields. His Principles of Optics (1958), co-written with Nobel laureate Max Born at the University of Edinburgh, is the most cited textbook in physics. His text Optical Coherence and Quantum Optics (1995) written with fellow giant of optics and paragon of Rochester physics, Len Mandel, is a modern classic, demonstrating the unparalleled longevity and staying power of Wolf’s contributions. In a 2012 Optical Society tribute to Wolf, colleagues and former students cited his ability to look at accepted knowledge and come up with exceptional questions and new insights. “For those of you who have not had the privilege of working with Professor Wolf in a ‘eureka’ moment, it is like watching a nuclear reactor about to go critical,” wrote Edward Collett, a former collaborator with Wolf. “The other thing that strikes me is that Emil, in spite of the countless accolades he has received over the years, does not take himself too seriously,” added Taco Visser, a former student with Wolf, now a professor of theoretical physics at Vrije Universiteit Amsterdam. Born in 1922, Wolf fled his native Czechoslovakia after Germany occupied the country on the eve of World War II. He earned his PhD in mathematics at Bristol University in England in 1948 and, in addition to working with Max Born at Edinburgh, was a postdoc at Manchester University before joining the Rochester faculty in 1959. In Principles of Optics, now in its seventh edition, Wolf described the then little-known concept of spatial coherence, central to understanding the soon-to-be-invented laser and was the first to fully explain the concept of Gabor’s holography. The book remains “the international standard graduate-level textbook in optics, and one of the books most likely to be found on the shelf of a professional physicist,” says Watson. “The fact that the closely related concepts … appeared so early in textbook form had a formidable impact on science and physical optics engineering,” notes the preface to Tribute to Emil Wolf (2004), a book published by the Society of Photo-Optical Instrumentation Engineers (SPIE). 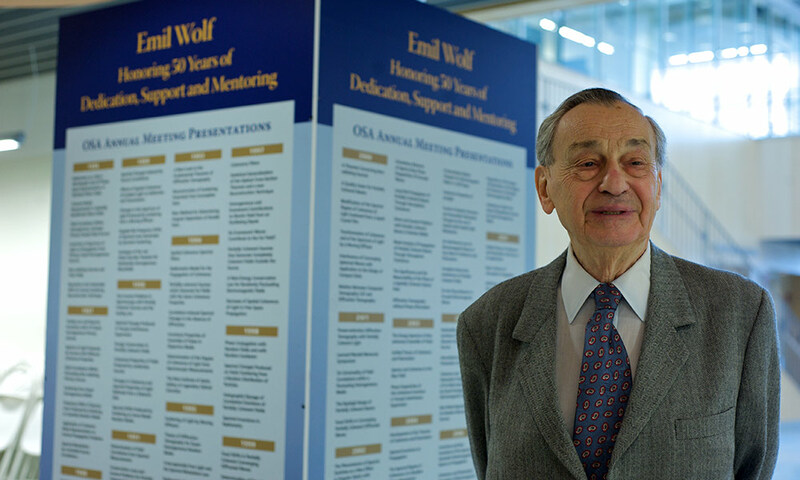 Emil Wolf celebrates 50 years as a Rochester faculty member. Well into his 80s, Wolf remained an active teacher, researcher, editor, author, and, as Christian Brosseau observed, a “living legend” for Brosseau and other young scientists in the field. “A generation of students have learned the basics of optics thanks in no small part to courses based on Principles of Optics,” wrote Brousseau, now a professor at the Université de Bretagne Occidentale in France, in the SPIE tribute. In recent years Wolf’s research included investigations of inverse scattering, especially diffraction tomography involving random media. “Working under Emil, I felt less like I was an employee and more like a member of an extended family,” wrote Greg Gbur, a former PhD student in Wolf’s group, now a professor at the University of North Carolina-Charlotte. Gbur and other students fondly recalled dinners at the Wolf resident with Emil and his wife, Marlies. No matter how heated and passionate the discussions among group members became, “Emil always emphasized we would always end them as friends,” Gbur adds. “It turned out to be the perfect place for me,” wrote John Foley, another former PhD student in Wolf’s group, “a place where physics was serious but fun – because Emil genuinely cared about this students and always got the best out of us.” Foley is a professor emeritus at Mississippi State University. Wolf was the recipient of the Frederic Ives Medal of the Optical Society of America (OSA) (1978), the Michelson Medal of the Franklin Institute (1980), the Max Born Award of the OSA (1987), the Marconi Medal of the Italian National Research Council (1987), the Gold Medal of the Czechoslovak Academy of Science (1991), the Medal of the Union of Czechoslovak Mathematicians and Physicists (1991), the Gold Medal of Palacky University, Olomouc, Czechoslovakia (1991), the Esther Hoffman Beller Award for Outstanding Contributions to Optical Science and Engineering Education of the OSA (2002), and a Faculty Lifetime Achievement Award at the University of Rochester (2009). He was an honorary member of the OSA, of which he was the president in 1978. Wolf was able to attend the Optical Alumni Network Reception during OSA FiO 100th Anniversary Celebration at Rochester in September. The Institute of Optics and the Department of Physics and Astronomy announced the newly established Emil Wolf Graduate Fellowship, and unveiled an oil painting of Emil Wolf that will hang in a conference room at the Institute of Optics. He was also an honorary member of the Optical Societies of India and Australia, the Czech Learned Society and the Romanian Academy of Science and Humanities, and was the recipient of honorary degrees from the University of Groningen, the Netherlands (1989), the University of Edinburgh (1990), Palacky University (1992), the University of Bristol (1997), Laval University, Quebec (1997), the University of Franche Comte, France (1999) and Aalborg University, Denmark (1999).